"The top of the promontory, the highest point of the peninsula, boasts winning views of the lake"
"Here Catullus, the great poet of Latin antiquity, sang of the beauty of these places and his love for Lesbian"
Spanning 142 square miles, Garda—the largest lake in Italy—is a massive triangle of water measuring 32 miles long, from its northern tip at the spur of the Alps to its southern base in the Veneto region. Our journey will touch places of stunning beauty and deep history, where locals and tourists alike know how to enjoy nature, gorgeous food and incomparable wines. Heading down the “Serenissima” Highway out of Verona in the direction of Milan, we hardly expect to find a trove of wonders in under twenty minutes. Yet there is the sign for Peschiera del Garda, signaling how close we are to the largest lake in Italy. A couple minutes later, we pass the lake’s main outlet, Mincio, which skirts Mantua before reaching the confluence of the Po and flowing gently into the delta. The natural world suddenly looks lusher. Surrounded by an enormous body of water, the area enjoys mild temperatures that allow for the active cultivation of grapes and olives, as well as cedar, orange and lemon trees—trees otherwise nonexistent at such latitudes. Spanning 142 square miles, Garda is a massive triangle of water measuring 32 miles long, from its northern tip at the spur of the Alps—Adamello and Brenta—to its southern base, where we began our journey. The 346-meter-deep lake was formed during the Quaternary Period, when retreating ice sheets deposited large rocks to create the incomparable beauty of its western coast. Exiting the highway at Sirmione, we spy the nearby tower of San Martino della Battaglia, a reminder of the heroic standoff between the Piedmont armies and the Austrians during the Second Italian War of Independence. The commanding, intense blue of the lake, speckled with sailboats, is a sight for sore eyes on a sunny autumn day. A light wind ripples the surface. The waves form foamy arabesques as they crash against the rocks on the shore. The quaintness of the place is complimented by its architecture: the houses, villas and gardens that surround the lake keep a respectful distance. We continue down the peninsula, the narrow, verdant spit of land that cuts into the lake. The road is bordered by well cared for plant life and pastel-colored houses. 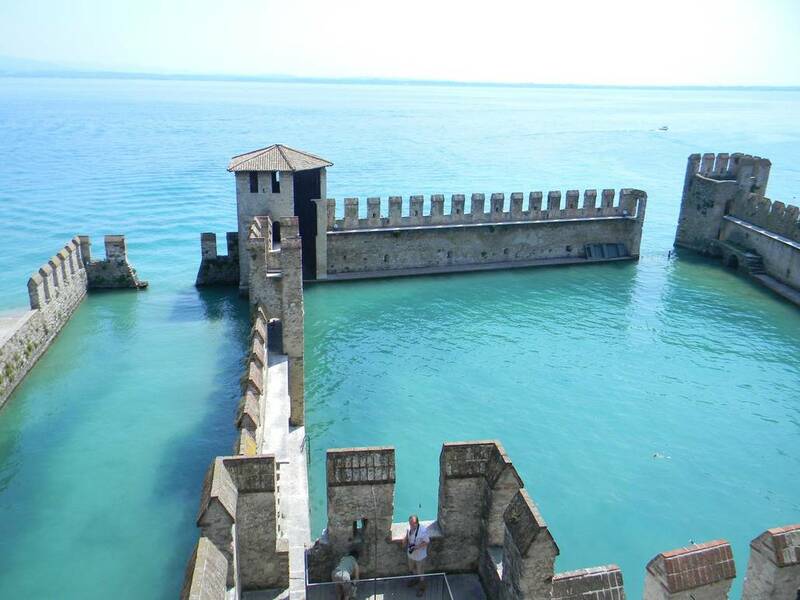 We park at Sirmione and walk the rest of the way to the entrance, which is presided over by the majestic Rocca Scaligera as well as swans that root around the banks of the moat. The crenellated castle is magnificent. Built in the 13th century under the dominion of Verona’s Cangrande della Scala, it serves as Sirmione’s marvelous anteroom. The town is laid out in the medieval style. Its narrow cobblestone streets are lined with small shops, bars and colorful window displays. Talk about charm. The various houses, hotels and shops combine to form a pleasant and harmonious whole. Near the shore, cypresses and laurel trees, myrtles and holm oaks stare into the deep waters. We stick to the road till the town recedes and the peninsula opens up, making room for hotels and spas. The top of the promontory, the highest point of the peninsula, boasts winning views of the lake. To the left it encompasses the alluring skyline of Desenzano and the impressive rocky western coast as far as Riva del Garda, and to the right it includes the low-slung Veronese shore, which only becomes hilly around San Vigilio, at the foothills of Monte Baldo. From this very spot we catch a glimpse of the remains of the Grottoes of Catullus protruding into the lake. Here, the great poet of Latin antiquity sang of the beauty of these places and his love for Lesbia. Gaius Valerius Catullus was born in Verona in 56 B.C. He lived to the young age of thirty, still long enough to pen elegies and meditations of rare intensity. During his life, he split his time between Rome—where he had friends and lovers as well as thorny relationships with Cicero and Caesar Augustus— and at his father’s house in Sirmione, where the poet felt comfortably rooted. During antiquity, Garda witnessed a sharp rise in the number of Romans, thanks in part to the fact that Via Gallica passed just to the south of the lake. That strategically important arterial road connected Mediolanum (Milan) to Aquileia. But Romans also flocked to the place for its beauty and charm, including literary and patrician figures like the poet Virgil and the historian Livy. Now this enchanting town draws a multitude of visitors. 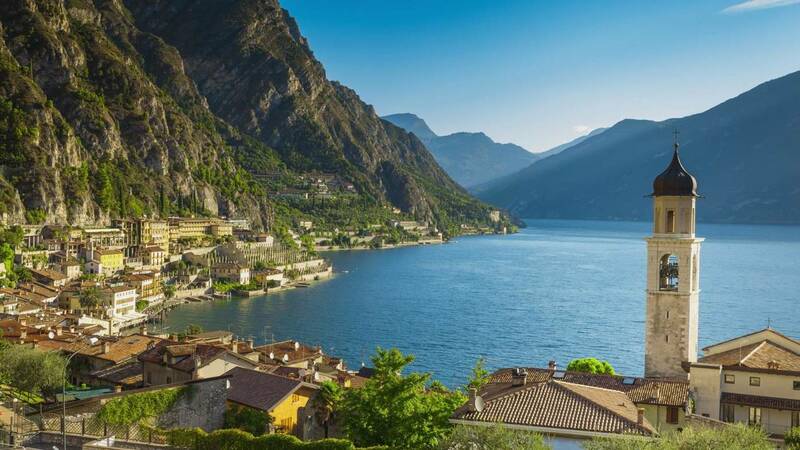 In fact all the centers around Garda have become destinations for cultural and sports tourism, the latter drawing fans of water sports and sailing. There is a steady stream of Italian tourists, but still more come from abroad, in particular Germany, as well as other European countries, North America and, more recently, the Far East. 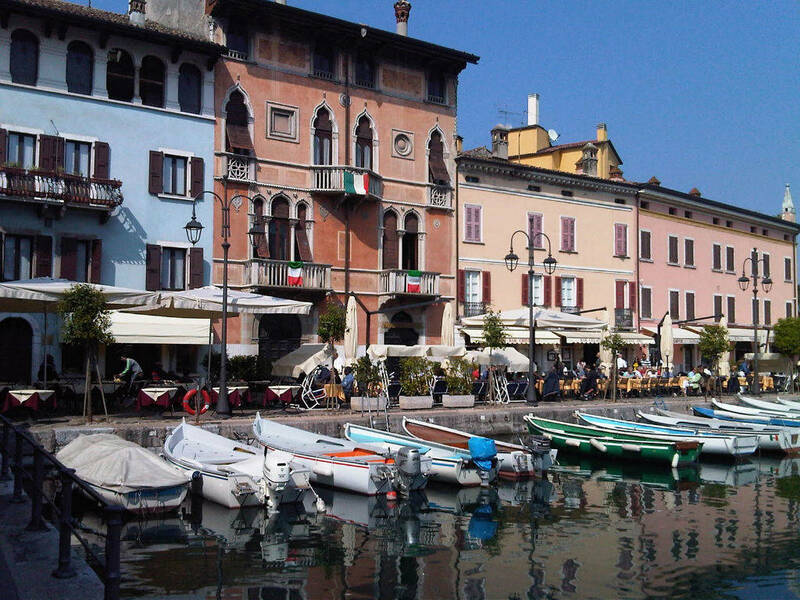 One of the biggest tourist magnets is Desenzano, a beautiful city today regarded as the capital of Garda, given its size (almost 29,000 inhabitants), its abundance of attractions, the quality of its year-round cultural events, and its fine hotels and other accommodations. From Sirmione it’s a ten-minute drive to one of the parking lots outside the city’s historic center, which is closed to traffic. This manicured urban center is more garden than city, sprinkled with colorful flowers, intriguing vistas and pretty nooks that open out to Lungolago, the boardwalk that spans almost 4 miles, from the hamlet of Rivoltella to the Lido di Lonato. 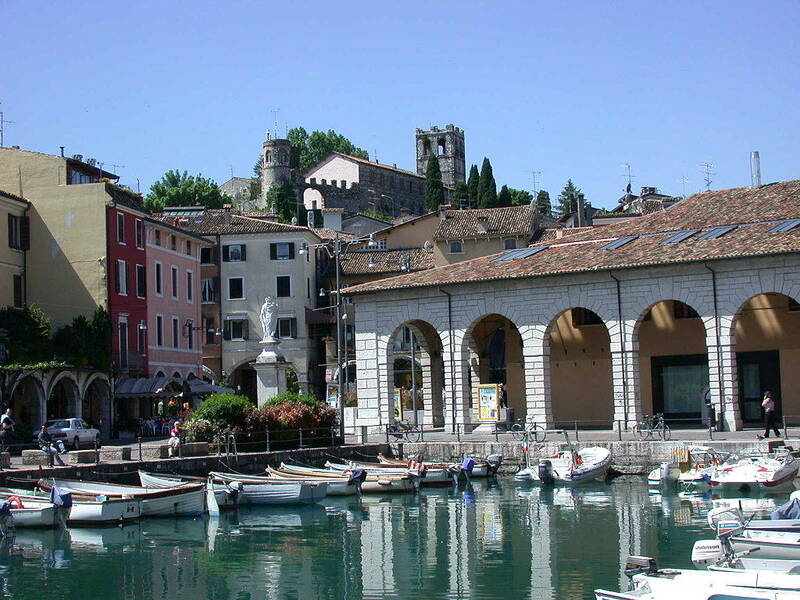 The center of the city has a port from which boats ferry people to the most visited areas of Garda. To the right of the port is a magnificent walkway where you can admire the play of waves against the shore. It’s like walking on water. You can also opt for a seat on one of Lungolago’s benches and appreciate the glittering hills and mountains jutting out against the deep blue waters. At the heart of Desenzano’s historic center is Piazza Malvezzi, distinguished by its porticoes and a statue of Saint Angela Merici. The city’s patron saint was born here in 1474 and founded the Order of the Ursulines. Off in the wings is the Duomo. Dedicated to Mary Magdalene and open for worship since 1611, the cathedral houses valuable frescoes by Andrea Celesti and a last supper by Giovanni Battista Tiepolo. There are several routes that climb up from the historic center to the highest residential area and forming a kind of amphitheater. The 11th century Castello sits at the summit. The strategic position of the castle suggests it may have been built on top of the ancient Roman castrum. Exquisitely restored by the municipality, it now hosts exhibits and concerts. Not far from the castle lie the stunning ruins of a Roman villa that was developed over several epochs, from the 1st century BC to the 4th AD. Today you can admire the villa’s splendid mosaics, a triclinium, a viridarium with some remaining murals and various lavatories and washrooms. An Antiquarium displays relics from a dig, and the nearby Archaeology Museum, housed in a former church, contains remnants from Bronze Age settlements around Garda. Not to be missed is an oak plow from 2000 BC—to this day the oldest object in the history of archaeology. Mention should also be made of a monument in Desenzano commemorating Francesco Agello, an Italian test pilot who broke the speed record, once in 1933 and again in 1934, right here on Lake Garda. In the 1930s, a group of pilots formed the famous Reparto Alta Velocità (High Speed Team) at Desenzano’s seaplane base. With their MC 72 Mach seaplanes, they would eventually claim three world titles for air speed and break the 700 km/hour ceiling. We hop back on the coastal road and take in the castles and fortresses gilding the towns that dot the hills and shores around the lake. Each merits consideration. Each merits a visit. 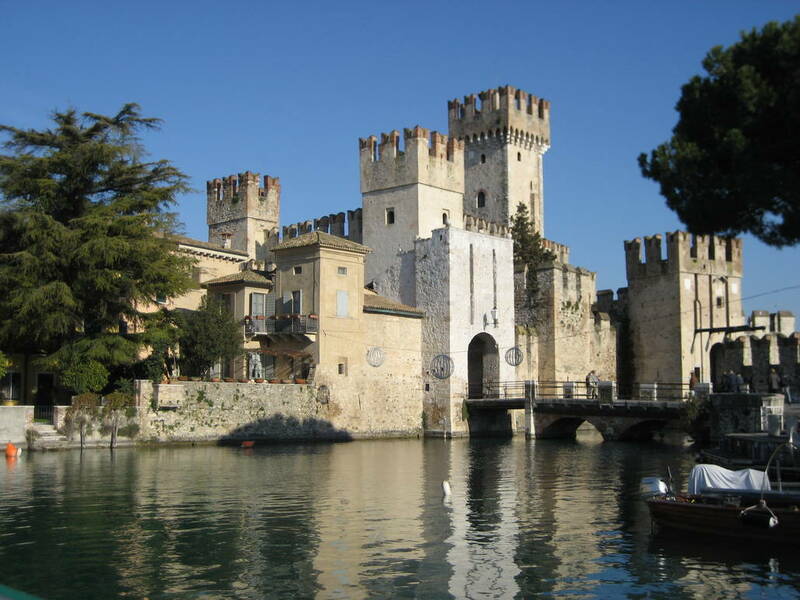 The Lonato and Soiano del Lago castles. The impressive castle of Moniga. The fortress of Manerba. The castle of San Felice sul Benaco. Our next stop is Salò, an enchanting town nestled in a cove. The town has preserved some of the pristine counters of a rich and powerful medieval village, despite suffering serious damage in the tragic earthquake of 1901. The splendid historic center is dominated by a bulky late Gothic cathedral. Inside the church are paintings by Paolo Veneziano, Zenone Veronese, and Girolamo Romanino. As the “Magnifica Patria” capital (traces of which can be seen in the precious palace connected to the Podestà) Salò was protected by a solid city wall. It is still easy to discern the old urban layout, despite the seismic activity and rebuilding. It takes after the Lungolago. Once a stronghold of the Viscounts of Milan, in 1426 it fell into the hands of the Serenissima Republic of Venice until the end of the 18th century. Salò later garnered unwelcome notoriety when in the fall of 1943 Mussolini established the headquarters of his notorious Social Republic there. Our trip ends in Gardone Riviera, otherwise known as Vittoriale degli Italiani, where it’s impossible for an Abruzzese such as myself to neglect to pay my respects to Gabriele d’Annunzio, even if our understanding of the world differs significantly. Born in Pescara in 1863, d’Annunzio was one of Italy’s greatest poets, dramaturges and writers—given his sheer output and linguistic innovation—and the major figure in the Decadence movement. But he wasn’t only a man of letters. He was also a politician, journalist and soldier whose heroic and reckless acts became the stuff of legend: the flight over Vienna, the Bakar mockery, the endeavor to create a free state in Fiume. D’Annunzio proved too troublesome for the fascists. Despite singing his praises, they “confined” him to Villa Cargnacco, which “Vate” himself rechristened Vittoriale and transformed into a mausoleum—of extravagant and highly questionable taste—filled with mementoes and mythological symbols that celebrated his egolatry. There, d’Annunzio indulged in his decadent taste for “excesses,” living out his days in a gloomy yet gilded solitude, until his death on March 1, 1938. 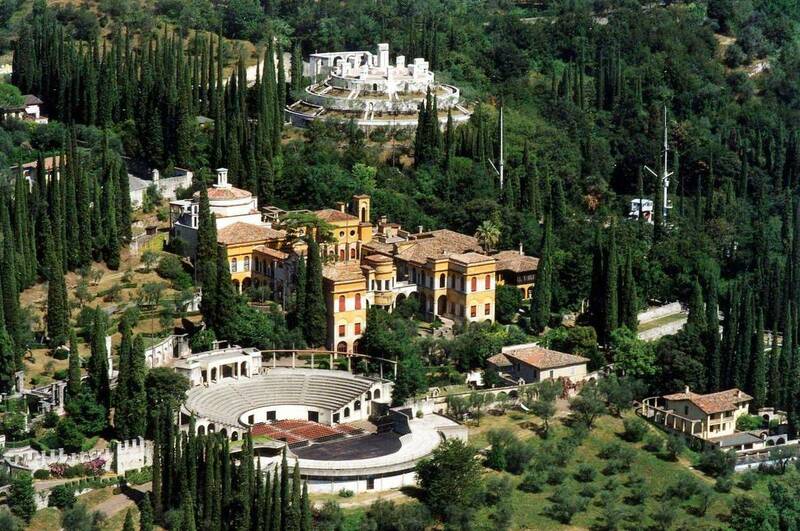 Today the Vittoriale has become a monumental facility and museum. Vate’s one addition is a panoramic open-air theater. The house is currently managed by the Fondazione del Vittoriale.